Mahableshwar .. Warmer than Mumbai!! Mahableshwar, a Hill station in Maharashtra , at a height of 4500 feet ASL, is also caught in the grip of the National Heat wave. The station recorded 36.4c (5c above normal) on Friday. Of course, the hottest April ever is not touched, which was a hot 37.6c on 21st April 1976. The highest ever record for Mahableshwar is 38.2c on 24th March 2003. Pune soared to 40.8c and Aurangabad was hot at 41.2c on Friday. The heat now creep into the heat prone region, Vidharbh. 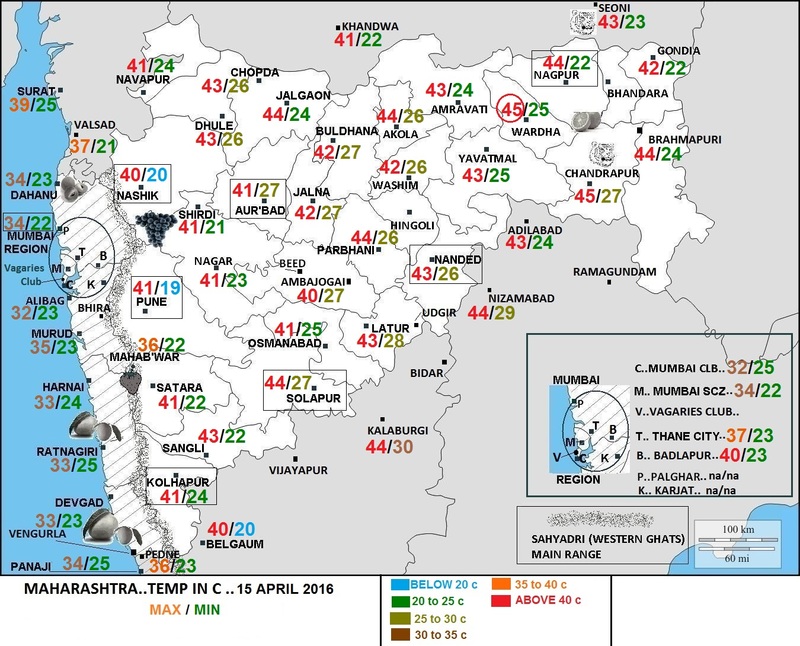 Wardha was 45c on Friday, Chandrapur 44.6c and Akola 44.4c. Nizamabad records a sizzling 44.9c ! Titlagarh (Odisha) recorded 45.7c ! Kolkata DumDum has risen to 41.2c on Friday. Bangalore was at 37.5c. and Bangalore (HAL) was at 36.7c. Max informs us of New Record for Chintamani town (Karnataka). The town recorded 38c on Thursday, beating its previous high of 37.6c recorded on 12th April 2010. Heat has started in full strength in Pakistan also. On Thursday, Dadu was 46c and 45c at Pad idan, Jacobabad and Sh.Benazirabad. On Friday, Pad idan and Sibbi recorded 43.5c and Jacobabad 43c. Chitradurga in Karnataka saw max temp of 40.2c today & yesterday saw 40.3c !! so an consecutive 40c mark temp !! Also it an highest temp ever for the month of April with new record been set!! As all time record was 39.8c on 22 Apr 1998 !! While India under grip of heat on other hand desert UAE is under flood/torrential rains!!! SSET, check IMD data. As per IMD the max so far in bangalore is 37.5. You neither stay in bangalore nor are an expert in bangalore climate. What are you trying to prove? A little respite in Calcutta today from extreme heat. Why is it so windy nowadays?